"It is [Turkish Prime Minister Recep Tayyip] Erdogan who should be asked about this act... He and his party bear direct responsibility," Zoubi said. "As an assassin, he should resign." After Saturday's bombings in Hatay province on the Turkey-Syria border, Ankara warned it would take “all retaliatory measures necessary,” raising the prospect of an escalation in the conflict. "The attack has nothing to do with the Syrian refugees in Turkey, it's got everything to do with the Syrian regime," Turkish Foreign Minister Ahmet Davutoglu said in an interview with Turkey's TRT television. 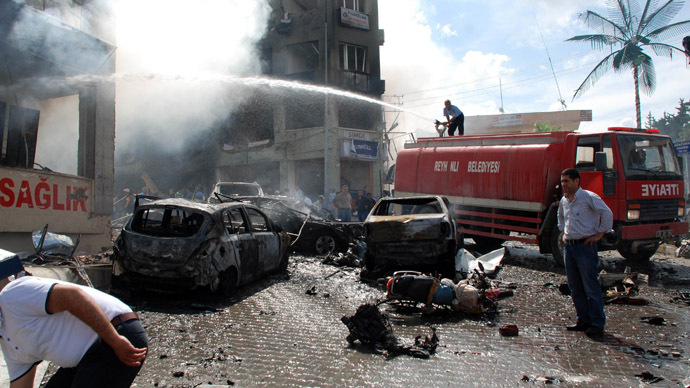 He said those behind the deadly Saturday's bombings were allegedly behind an attack on the Syrian coastal town of Banias that reportedly killed at least 62 people in early May. The London-based NGO Syrian Observatory for Human Rights blamed “the army and Alawite members of the National Defense Forces” for the mass killing in a Sunni neighborhood of the Syrian city on May 3. “I think what’s important now is not to rush into accusations very quickly and especially without having solid proof. I think it requires much more responsibility and commitment from all sides to hold back from escalating the situation. You can’t just really discover the perpetrators behind such an explosion within less than one day, less than 24 hours. So I think it’s a bit irresponsible of Turkey to rush into this accusation,” Sharro stated. Ankara warned it will take “all retaliatory measures necessary” raising the prospect of an escalation in the conflict. The investigations into the bombings has almost been completed, Turkish interior minister Muammer Güler told local press, announcing that the perpetrators were “linked to the Syrian regime and intelligence agency” and had nothing to do with the Syrian opposition and the refugees. 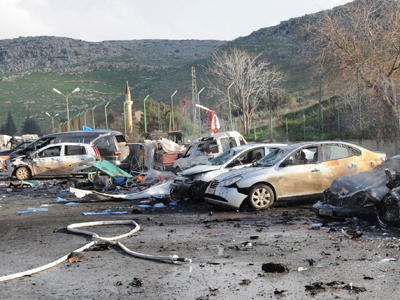 On Sunday, The Turkish law enforcement officers have detained nine people in connection with the Hatay province bombings. According to country’s Deputy Prime Minister, Besir Atalay, all of them are Turkish citizens, who have been cooperating with Assad’s regime. Top Turkish government officials, including Prime Minister Erdogan, were quick to place the blame with Syria, despite lacking any evidence at the time. The “usual suspect” in such a horrific attack is Syrian government, Turkish Deputy Prime Minister Bulent Arinc announced after the blasts pledging to do “what is necessary” if Assad regime’s guilt is proven. 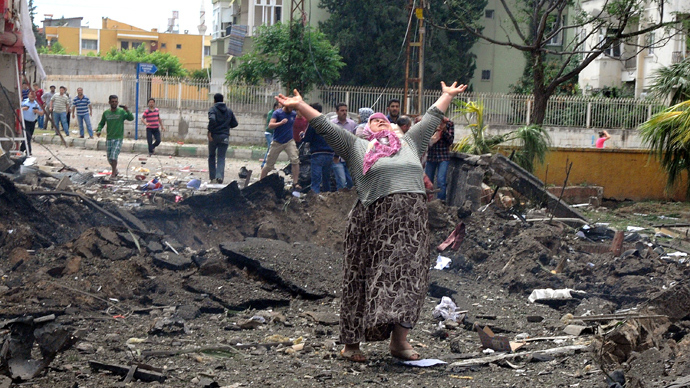 "We know that the people taking refuge in Hatay have become targets for the Syrian regime," he said. "We think of them as the usual suspects when it comes to planning such a horrific attack." Turkish Foreign Minister, Ahmet Davutoglu, urged the international community to take action against Assad due to the mounting security risks in Turkey and Syria's other neighboring countries. 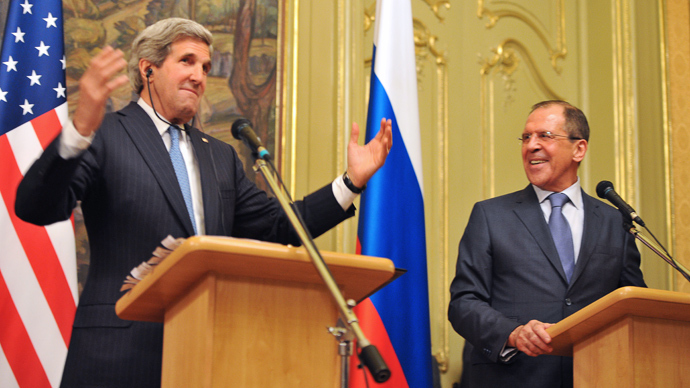 Provocation to disrupt Syria peace talks? Turkish Foreign Minister Davutoğlu called the attacks a “provocation,” saying that the timing of the blasts was not coincidental, referring to the recently proposed peace talks sponsored by Russia and the US. 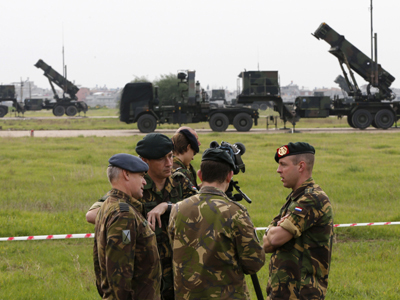 “Such provocation can [come to mind] in such a critical transition phase regarding Syria. It is not a coincidence that this happened when diplomatic traffic is intensifying. We invite our citizens to be prudent,” Davutoğlu told reporters during his visit in Germany on Saturday. Russia has raised concerns that groundless accusations and any subsequent adventurous third-party action could be disruptive. “In the terrorist attack in Turkey, Syria was accused again – as it is always blamed for everything. Someone wants to disrupt the peace conference and to push ahead with the use of military force,” Alexei Pushkov, Chairman of the Foreign Affairs Committee of Russia’s Duma stated on Twitter. The deadly blasts could even be an inside job, in the hope of encouraging international military action against Assad’s government, according to Marcus Papadopoulos, an editor for the UK's Politics First magazine. 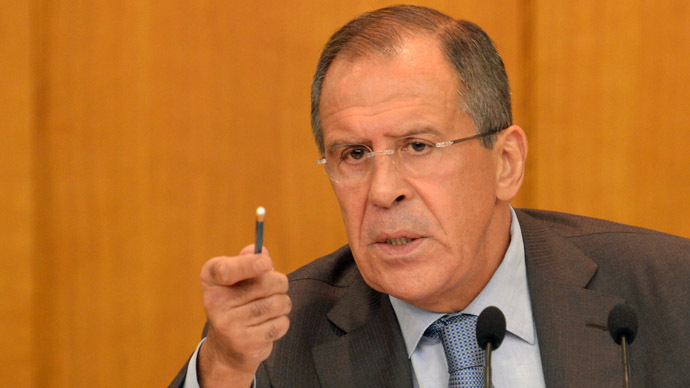 “Turkey has been pushing for intervention in Syria, Western military intervention. It’s been pushing for a no-fly zone over northern Syria,” Papadopoulos said. “Given that Turkish generals a couple of years ago were planning to provoke a war with Greece, why is it implausible that Turkish generals or members of Turkish intelligence services wouldn’t be doing the same today, to try and provoke a war against Syria and thereby bringing in NATO,” he told RT. Saturday’s twin car bombs exploded outside the city hall and post office, killing 46 and injuring a further hundred people and destroying local buildings in the country’s deadliest attack in more than a decade. Around 50 other people are still being treated in hospitals. A third explosion was later reported in the same city. However, local press later reported that the incident was unrelated. Police reinforcements were dispatched to the city after the bombs ripped through the streets of Reyhanli, which is home to thousands of Syrians who have fled the conflict. Some 300,000 are now resident in Turkey overall. Their presence has caused some tension in the city on the Syrian border, especially among those unhappy with the influx of migrants. 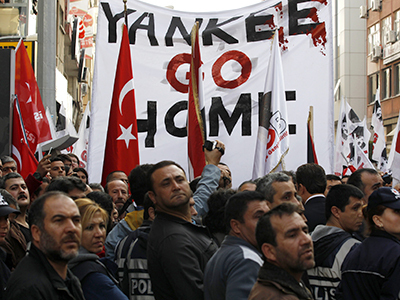 Following the blasts approximately a hundred of the city’s residents took to the streets outside Turkey’s Foreign Ministry, calling for the resignation of Prime Minister Erdogan and accusing him of a failed policy towards Syria which they believe led to the assault. Some locals have also blamed Syrian residents for bringing violence over the frontier, resulting in attacks against refugees. “We heard that there were some reactions from local Turkish people against Syrian cars and Syrian people. Police reinforcements have been sent to prevent that sort of thing,” an anonymous Turkish government official told Reuters. Some 60 people also marched in Ankara, Turkey’s capital following the blasts. The demonstrations were quickly dispersed.